You are here: Home / Blog / Essential Oils EVERY Home Needs and what to do with them!! Essential Oils EVERY Home Needs and what to do with them!! I received product from doTERRA to do this review but all opinions are 100% my own! 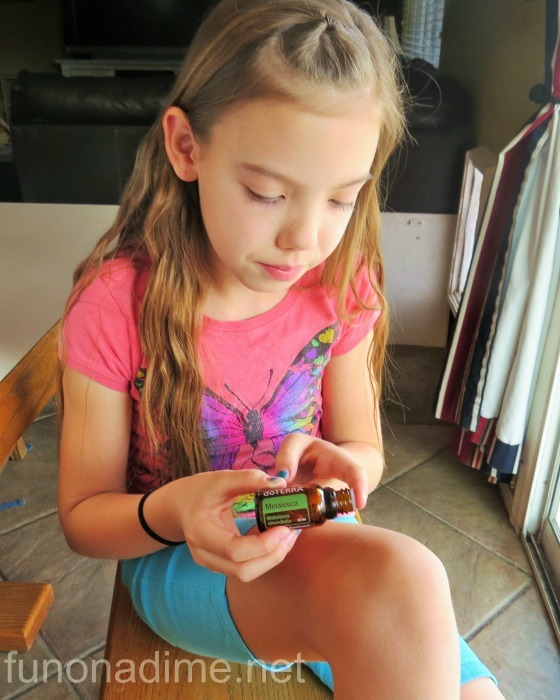 I started my oil journey over 6 years ago because I had 4 little kids at the time and seemed like I spent a lot of time and money at the Dr.’s office. Don’t get me wrong I love my pediatrician but I knew there had to be something I could do at home first. Fast forward 6 years and the oils are second nature to our family and it is always “Our First Line of Defense“!! We still visit our pediatrician for well checks but I have gone entire years with no sick visits! I think with 7 kids this is quite the accomplishment!! After reading about all these fabulous oils you are going to want to try some so make sure you read to the end to find out how you can get some for yourself!! How did I do this you ask? Not a day goes by I don’t use lemon. I drink it in my water to help with digestion every day. 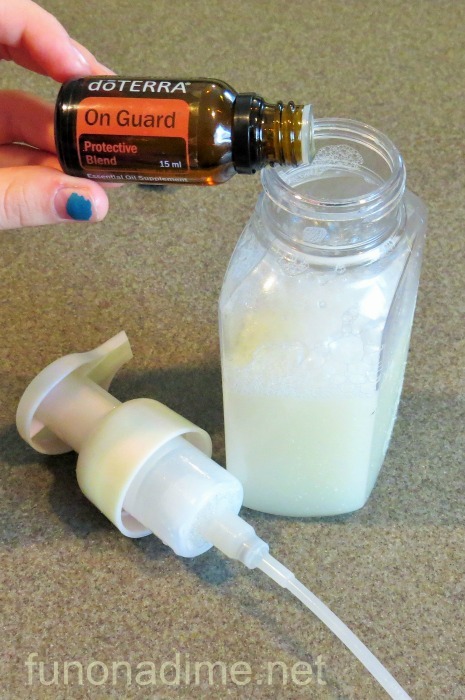 When my kids have colds I dilute 2 drops in 2 T. fractionated coconut oil and rub it on their feet and chests. It works wonders on their poor runny noses! Mix with peppermint and lavender it will send your “seasonal congestion” running away!! I can clean with it too! Peppermint is fabulous on fevers when the littles are sick. Rub a little on the back of their neck and bottom of feet. Put a drop on your thumb and press onto the roof of your mouth for an afternoon wake up and it freshens breath too! Peppermint can be rubbed on the tummy for upset stomachs and combined with the Digestive Blend (Digest-Zen) works even better. I combine it with Deep Blue and lavender for migraines and it knocks them out flat. Lavender is fabulous for bug bites and burns. It stops itching and the burning sensation within a few minutes. It is also good for helping bodies relax and sleep. I rub a little on the bottom of my sons feet and along his spine before bed to calm him down and help him relax to go to sleep easier. This is my favorite oil because it helps with my migraines. To ease my migraine I rub deep blue, peppermint, and lavender on my temple, forehead, and back of the neck. I spend a little while with a cold cloth over my eyes and my migraine should be headed out. A quiet room helps too but lets be honest with 7 kids that rarely happens! It also works well for muscle aches and pains. This one I use in my diffuser most often. It is antiviral and when diffused kills germs in the air. Whenever I have a sick kid I diffuse this to help it from spreading. You can put it on your kids’ feet before you send them off to school everyday to help protect them from colds and flu. This one is great for cleaning and a drop in the back of the throat or in a glass of water is fabulous for sore throats. I use it in my homemade hand soap to give it an extra germ killing kick! This is my go to for cuts, scrapes and bruises. It also helps with cold sores. Myself and a couple of my kids get them and it works great with peppermint for kicking them out fast! 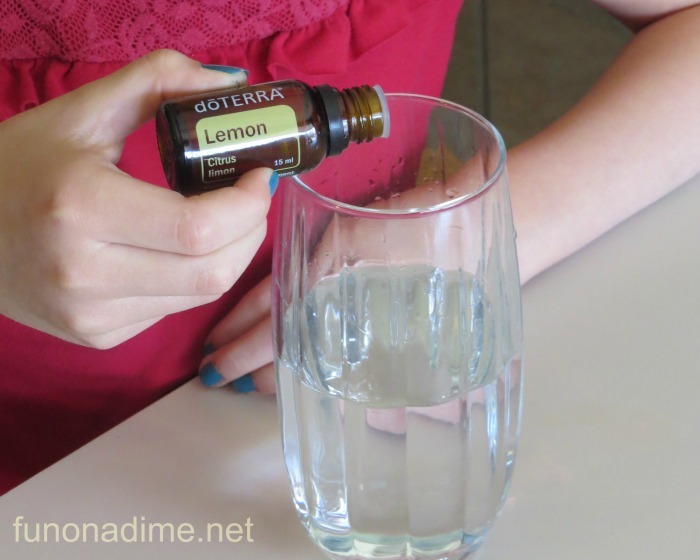 Put a couple drops in a glass of water and it eases a sore throat, too! If you have teens or tweens this is a great one to keep around for those inconvenient pimples!! Breathe is my go to for anything respiratory! I use it in the diffuser at night to help anyone who needs help breathing better. It also can be used as a natural inhaler. Place a dot on the palm of your hand, cup the other hand over it and then take a quick puff and your airways will open right up (see pictures below). This one works fabulous on anything in the digestive system. Rub some on your stomach for a tummy ache, constipation, diarrhea, and anything else you can think of. I like to pair it with peppermint for a kids tummy ache and it almost always makes them better fast! This is the oil of all oils! When in doubt use Frankincense. Now this oil is pricey, so I do use it sparingly, but what I use it for the most is for coughs!! It works wonders on a bad cough when put in a diffuser. One night of using Frankincense in the diffuser makes the worst cough go away. It’s like magic!!! 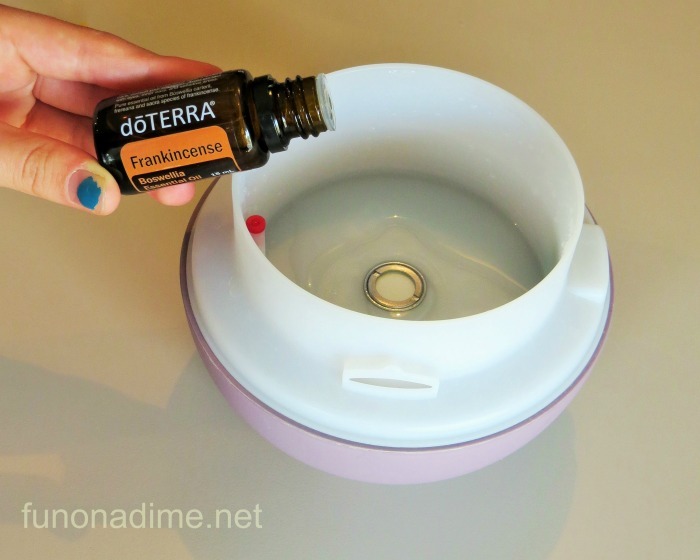 There are lots of other uses for Frankincense but this is what I use it for most often. 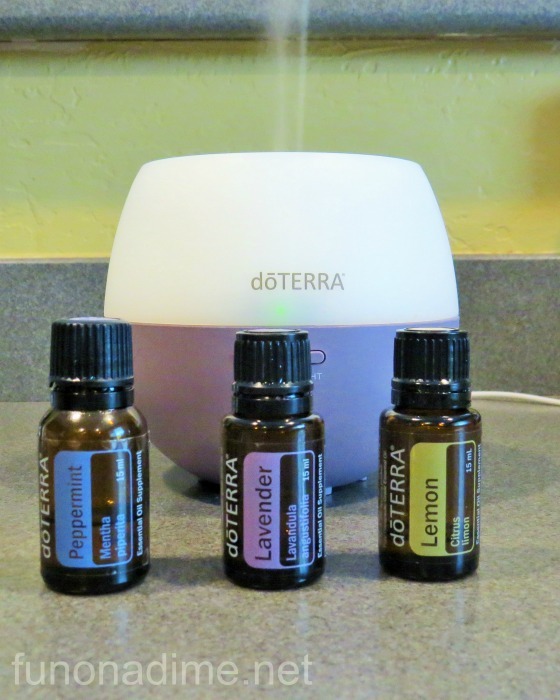 I have mentioned my diffuser a few times and I have to say it is my favorite doTERRA product! Everyone in my family fights over who gets to take in their room at night. I guess it is time to order some more! Right now everyone’s “seasonal congestion” have been just awful so I put 4 drops each of lemon, peppermint, and lavender and it has stopped our allergies in their tracks!!! I can’t believe how well it works!! So you made it to the end, now how do you get your own??? Enter this weeks drawing for a free introductory kit which includes a 5ml bottle of lavender, lemon, and peppermint! Enter to win an introductory kit of doTERRA essential oil using the form below. This giveaway will end 4/28/15 at 10:00 pm AZ time. All extra details are below! Good luck. If you do not see the form, click here for the link. BONUS ENTRY 1: After you fill out the form, share this post on your favorite social media and leave a comment below this post in the comment section. Tell us where you shared. One social media share bonus entry per person. If you win, we will ask for verification. p.s….you can use the share buttons on the left side of the screen to make it faster! I am sure you saw an oil that you want to try at your house so we want to send you one!!! If you are not already a doTERRA wellness advocate tell us in the comments what oil you would like to try and what you would use it for and we will pop it in the mail to you for FREE! Feel free to ask any questions as well we will happily be answering them!! Have a FABULOUS day and I can’t wait to see what oils you want to try! I would love to try the DigestZen. I seem to have so many stomach problems and would love to see if this helps! Thanks for offering us these great products. I am so glad you would like to try Aliza! Email me your address at courtney@funonadime.net and we will get one right out to you!! Just the other day I read about the benefits of Grapefruit Essential Oil and how it cleanses and detoxes. I would love to try this one. 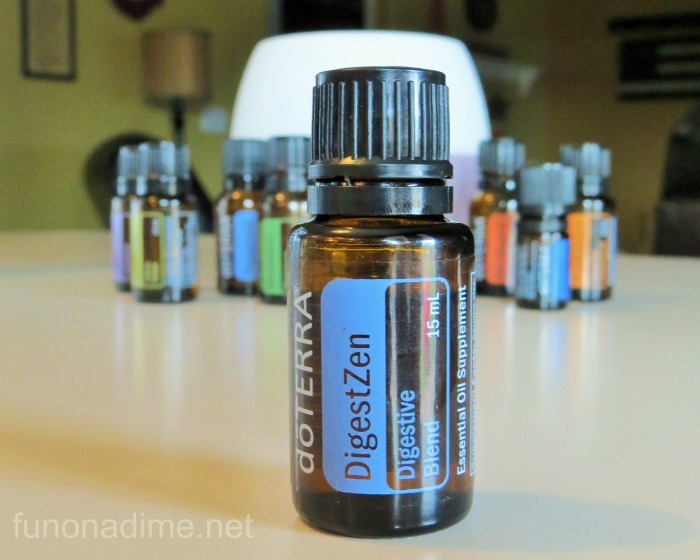 If that is not available then the DigestZen would be another one I would love to try for my stomach issues. Hi Amy- I have never tried grapefruit but it sounds fabulous. I will see what I can do about that one but I will for sure send you the digestZen! Send your address to me at courtney@funonadime.net and pop them in the mail for you. Hi Courtney. Okay. I have lavender at home and use it occasionally and now I think I need more oils and a diffuser. We aren’t sick often but it’s no fun when we are. Maybe I could try on guard? Or digest zen. Whatevs. Hi Alli-I would love to send you both!! I’ll drop them by your house on Sunday evening if you’ll be home. You can email me at courtney@funonadime.net if that is okay!! I love these oils. I have been using them for about four or five years now. The one that sold me was lavender. I had a huge mosquito bite that nothing was helping with. It was about a third of the size of my arm and I hadn’t even scratched it. I put a bit of lavender on it and it was just a little pink bump within five minutes and it didn’t itch. Peppermint is also wonderful. I wouldove a sample of on breathe or on guard! I would like to try on guard! Hi Angela- OnGuard is my favorite germ killing defense. Anything to keep the kiddos healthy!! I would love to get you some. I will try and drop it off this weekend!! I have never tried oils but i have heard about them but know nothing about them. I would love to try oregano and on guard. I have some skin tags ive been trying to get rid of. Hoping oregano does the trick! Hi Shannon- I am so glad you are wanting to try! Oregano is a powerful oil and even after 6 years I am still learning about this one. I would love to send you both. Email me your address at courtney@funonadime.net! I would love to try the deep blue oil. I get migraines, and would love to try a natural way to get rid of them. Alright. I think I’m about to cave. I’ve been wanting an intro kit for the last year – I just can’t decide between Young Living and Doterra. I purchased a large Lavender from someone local (Doterra brand) and we use it every single night on my daughters feet. My husband thinks it’s ‘witch voodoo magic’ but I keep telling him if we can save trips to the doctors office (daughter has a bad immune system and our house is sick every other week) how much time and money we would save. I’m praying (literally) that I win, if not…..Well, I’ll start saving! OH, and for a sample I’d LOVE to try the Frankincense….. I am new to essential oils. I have a super-active grandson who has a hard time unwinding. The first time I used lavender I was amazed at the results. He had been bouncing off the walls and after using the oil on him, he was asleep in 5 minutes. It hasn’t happened quite that fast since, but it still only takes about 15 minutes. Now his brothers are begging for the “good smell stuff.” They all respond very well. Would love to try the orange as I hear it is also calming although I am torn because I get migraines, too, and Deep Blue sounds magic. I would love to try Eucalyptus and/or Rosemary. Thanks for the giveaway! I would love to try frankincense. I’ve used other oils, but not this one. I’ve heard it’s a multipurpose oil. Since I plan on winning the others. I think deep blue will with my neck pain or maybe the melaluca for inconvenient pimples! Lindsey I love your confidence! !I will happily get both for you:) I’ll deliver! I’m just hearing about oils and hoping to learn more. Sounds fabulous. Just started making some spa products (as gifts) and switching to more natural products for use at home. Would love more oils to experiment with! Thanks! I’d like frankincense for coughs.